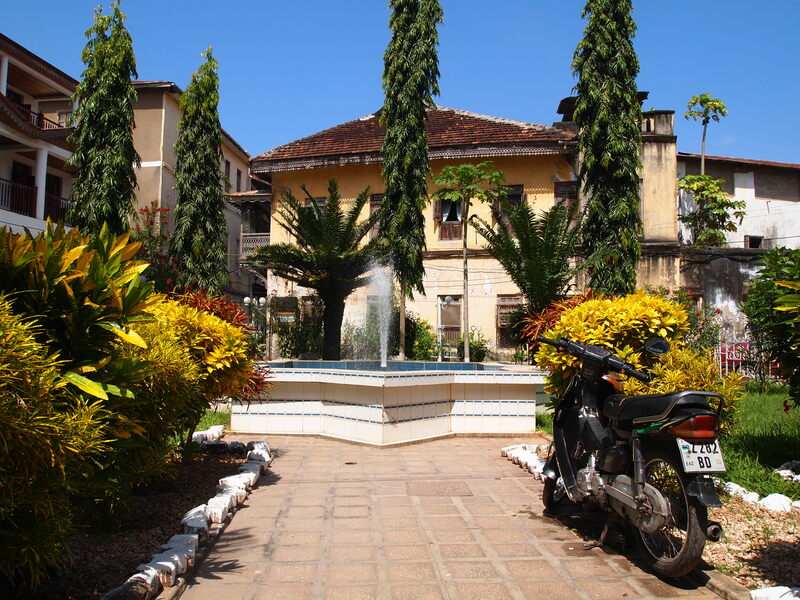 I’ve just began my own Meetup group called Travel Spirit Meetup Group. If you’d like to take a look…here’s the link! 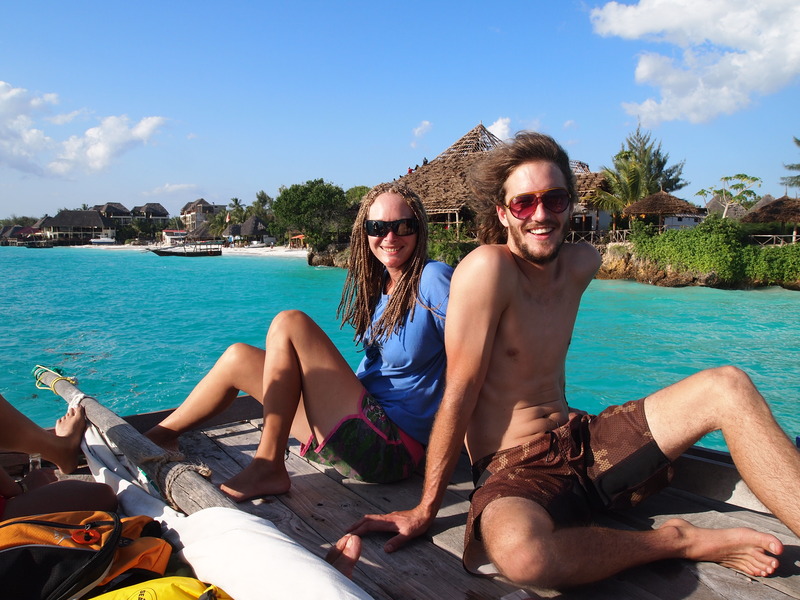 I’m very excited to begin organizing meetups to travel together and to share our tips and travel stories! It doesn’t matter where you live…if you join, you could still meetup with us somewhere! 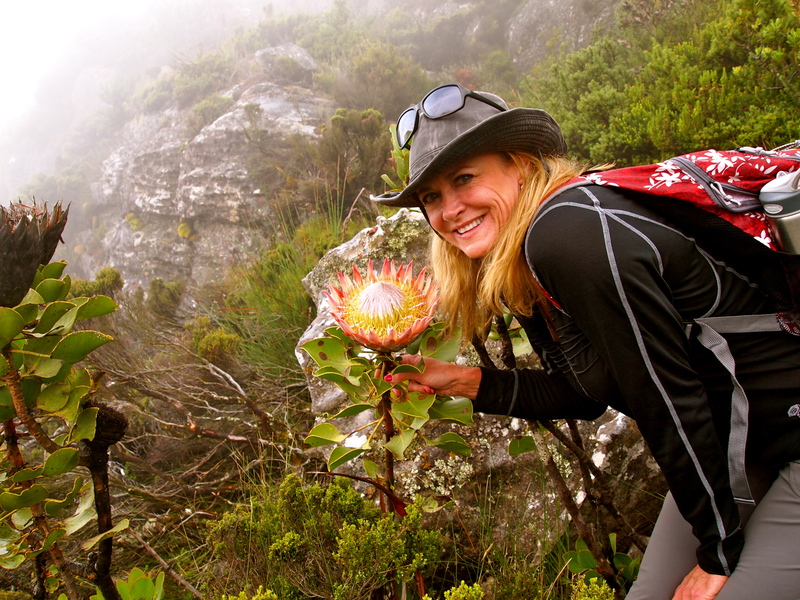 I’m working on another Powerpoint presentation…from my 40 day trip through six countries in Africa. It will have to be split into two presentations because I have over 200 photographs and an hour isn’t long enough to share 40 days of adventure! There are many words one could use to describe people in Africa, but spirited seems fitting to me! Every time I’m able to take a photo of someone who seems interesting to me…I feel like I’ve just been given a present. 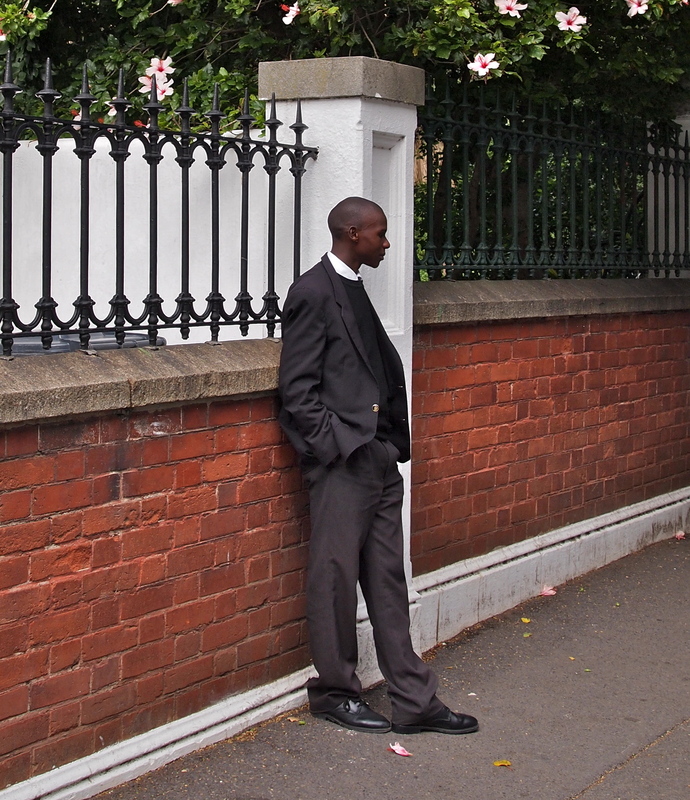 When I saw this man standing in Cape Town, South Africa, I just had to take his photo. Actually, he posed for me. I asked him to turn sidewise. It all happened in the space of less than 30 seconds. To be a travel photographer, I think it’s important to have an outgoing personality, so that you’re able to approach people easily. 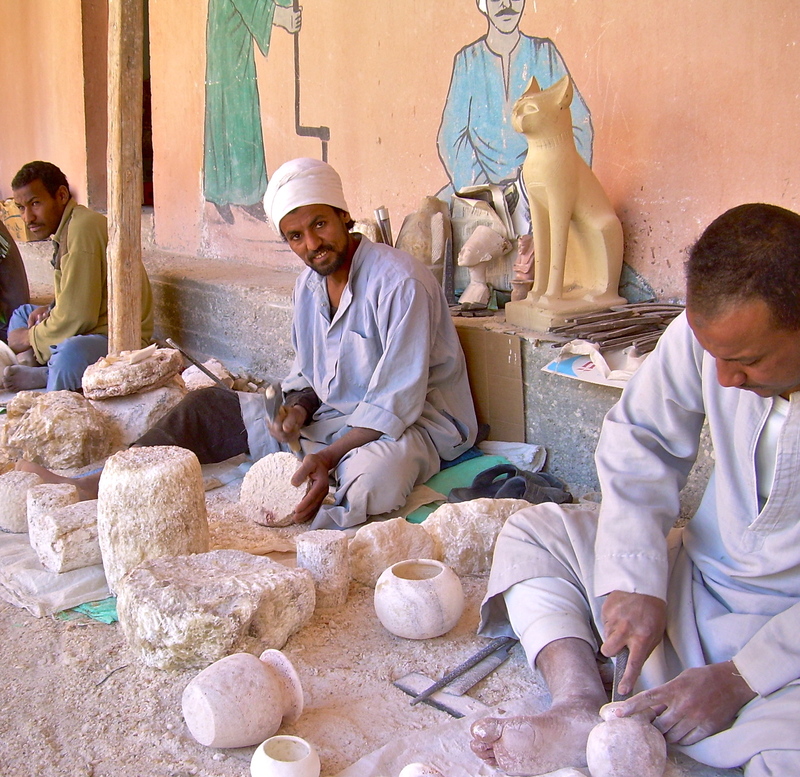 Another series in my People from around the world…Exotic People from Egypt! Why is that some men from Egypt have this mysterious and perhaps a bit of danger look in their eyes? 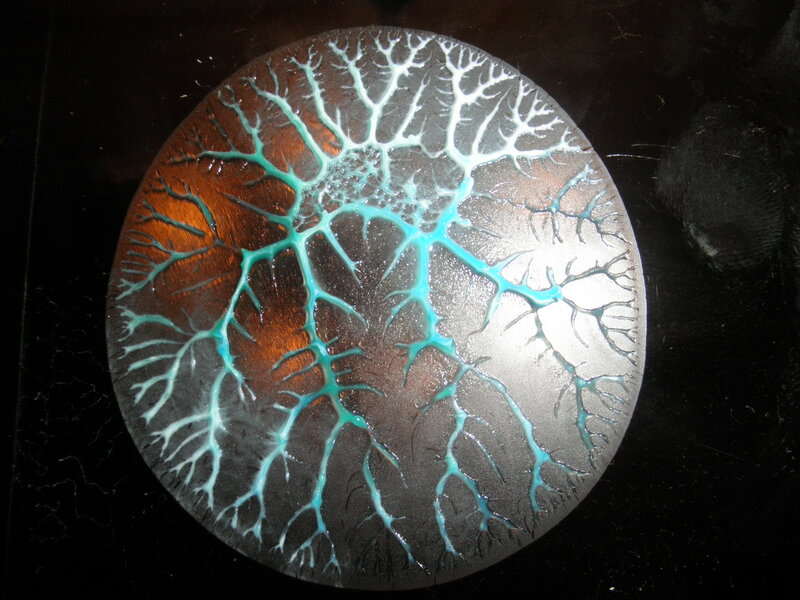 I find it quite fascinating! 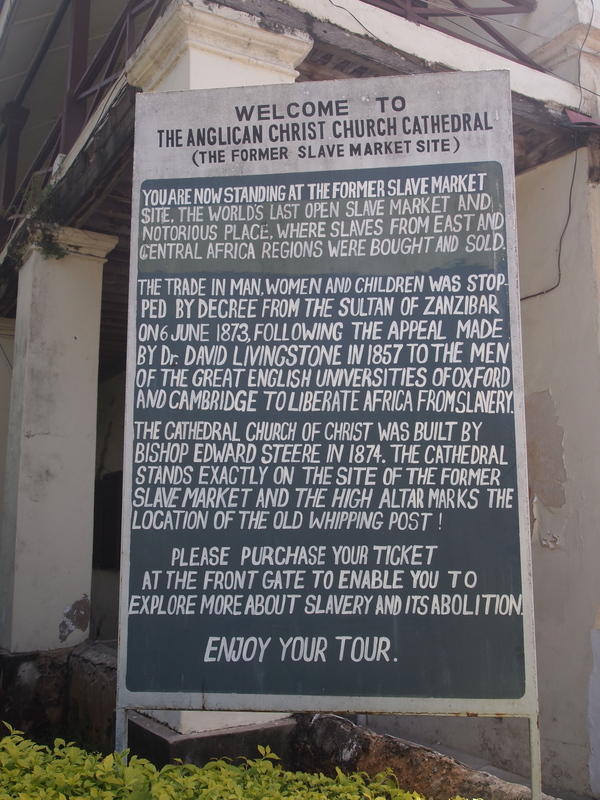 and saw that it was the former slave market site. It was only a few dollars to view it and there were a number of guys standing around offering to give tours, so I asked one of the men how much he charged. He said he worked for tips…whatever I wanted to give…so off I went for a tour! The tour lasted about 20 minutes. 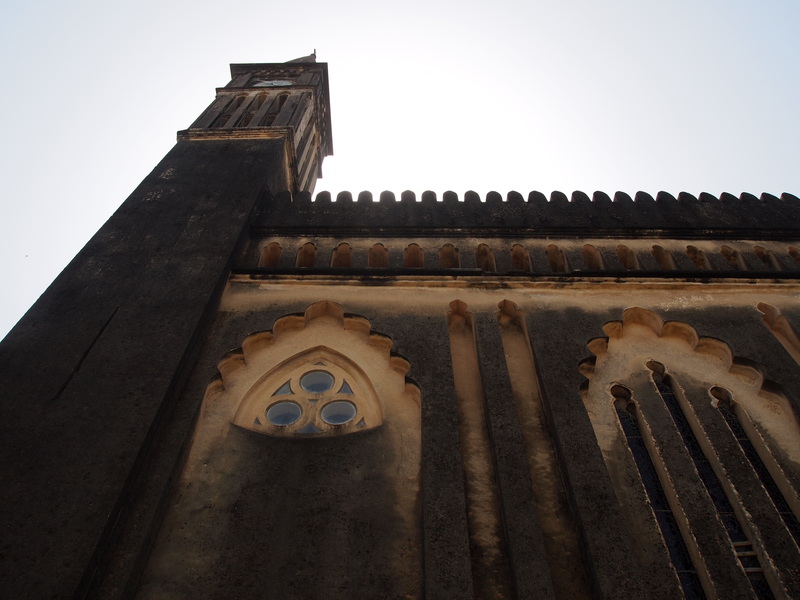 First we walked through the church and he explained that since slavery had been abolished in the States in 1863 and it wasn’t abolished in Zanzibar until 1873, for those 10 years, the slaves were shipped to other countries other than the U.S., such as Dubai and other Middle Eastern countries. 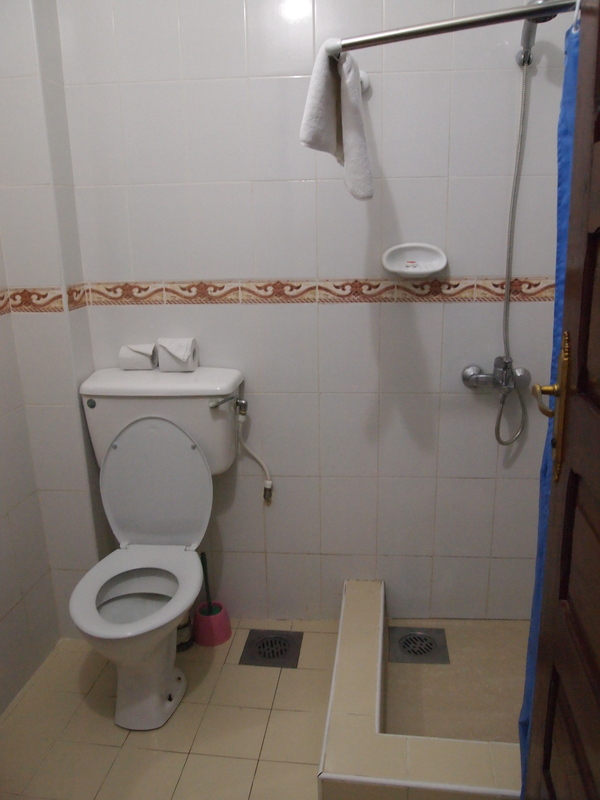 While researching for this post, I found information that is contrary to what my tour guide gave. 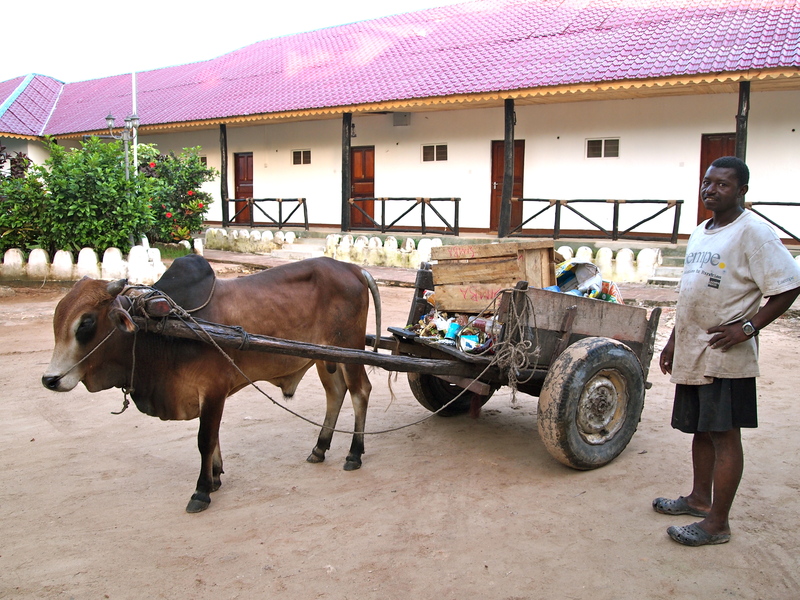 Actually, slavery wasn’t completely abolished in the U.S. until 1865 and in Zanzibar until 1897. 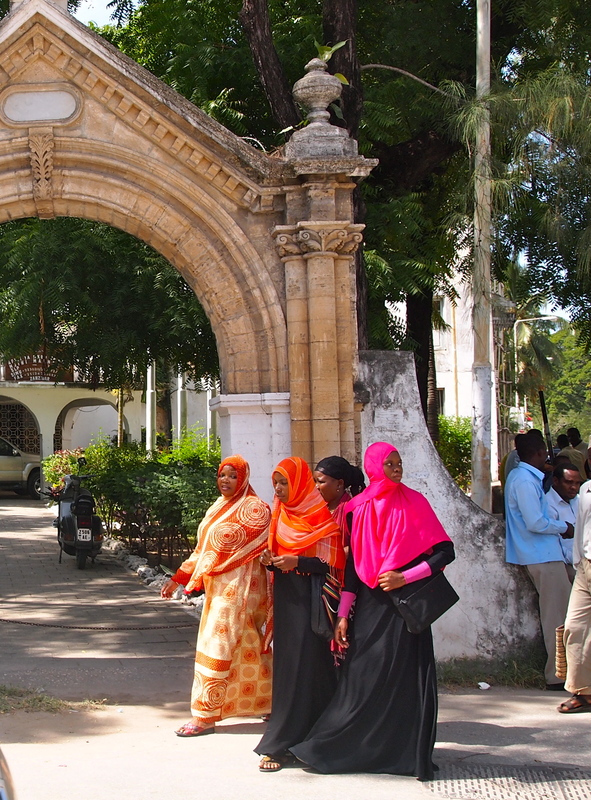 There was a treaty signed with Britain to suppress slavery in Zanzibar in 1873. Here is an underground area where the slaves were kept. 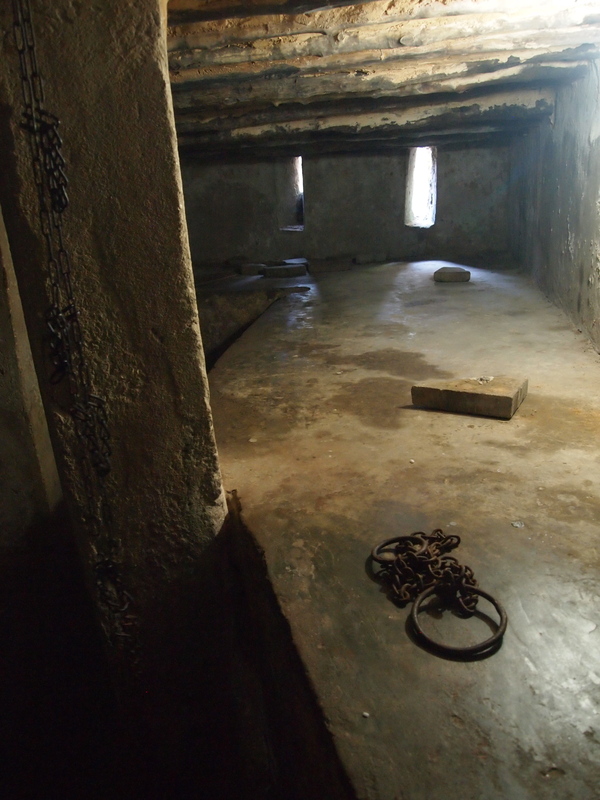 The guide said as many as 50 women and children were in this one room where they slept. This area had a palatable sadness. 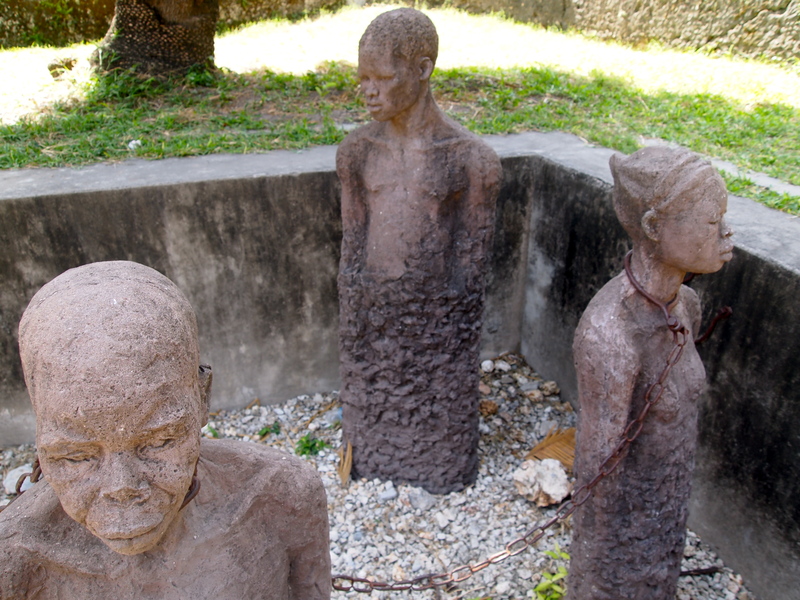 Seeing the shackles and trying to imagine living in these conditions left an imprint! 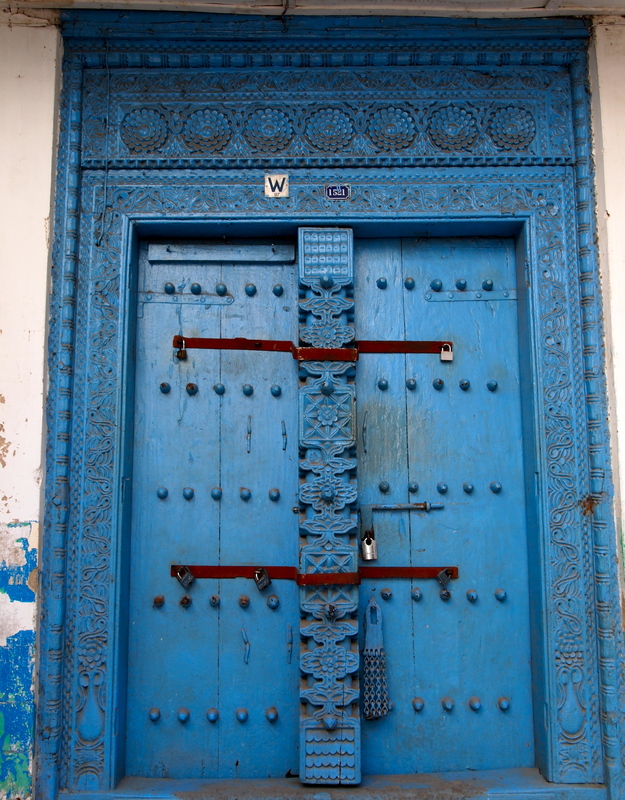 The last country in Africa to abolish slavery was Niger in 1960. Even then it wasn’t illegal until 2003. From 1960 until 1981 slavery was abolished in Saudi Arabia, Yemen, United Arab Emirates, Oman, and Mauritania, respectively. I was surprised by this. Although slavery is illegal in all nations, it still exists, or forms of it, throughout the world! Here are some random photos that I thought you’d enjoy from my recent trip to Africa. The first two are from an experiment that Neil (the husband half of the couple that I Couchsurfed with in Cape Town) performed. I mentioned to him that I thought everything was connected in the world. Much more than we realized and he agreed. 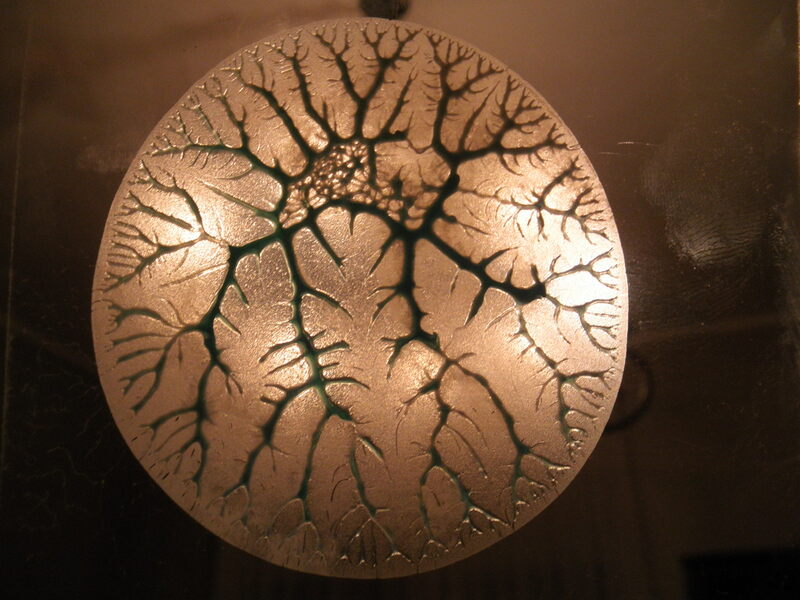 He took two pieces of clear glass and placed a dab of toothpaste on one of them, then he pushed them together and pulled apart. This is what the results were. The first one is with flash and the second without. As you can see, every pathway is connected to another! I thought it was pretty cool! 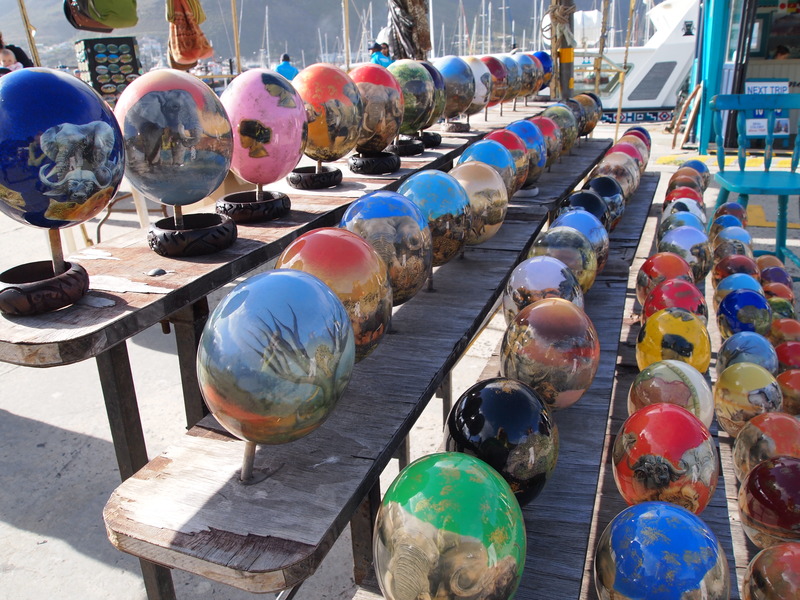 These ostrich eggs were quite bright and artistic!! This photo is from Namibia. It is a social weaver birds’ nest. They were flying in and out as we stood watching the gigantic nest! 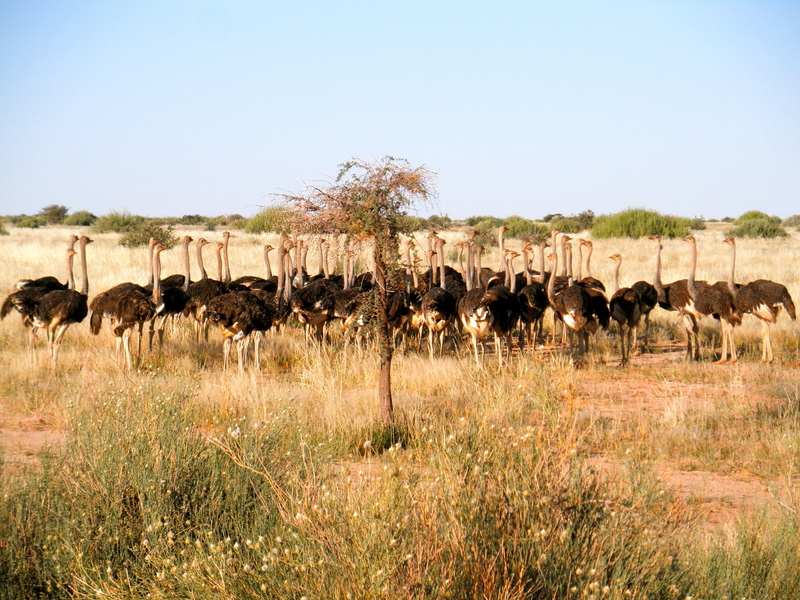 Also from Namibia…a herd of Ostrich! This was potato placed into a shape to dry. Not really sure how you eat it! 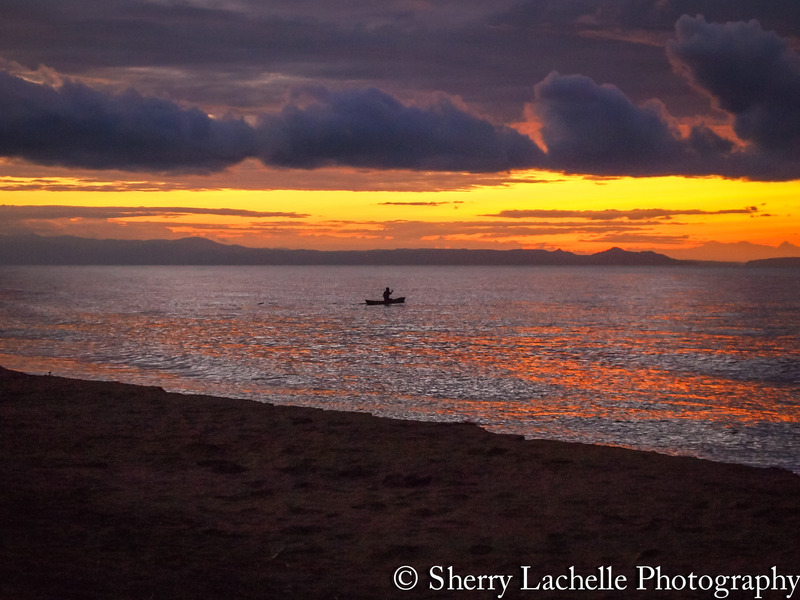 From Malawi! 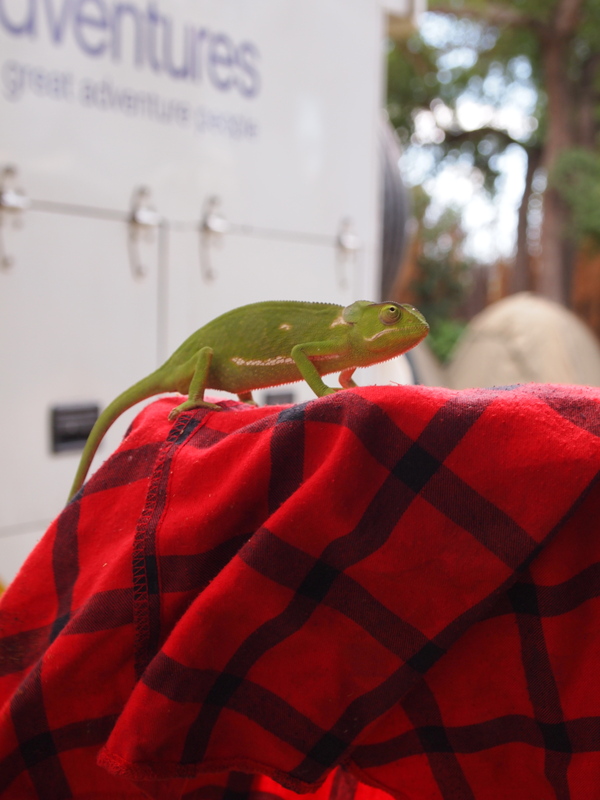 As you can see….a lizard or gecko! These little boys were at a stop in Namibia. I gave them a beach ball and got back on the overland truck. When I looked out at them, the one on the right rubbed his tummy to indicate he was hungry so I threw a banana and an apple out to them. This lady was at the same stop as the boys above. Her colorful quilted jacket was quite decorative! Lots of living on her face! Hope everyone has a wonderful 4th of July and I’m grateful I live in the U.S. (but can travel to visit other places)!! 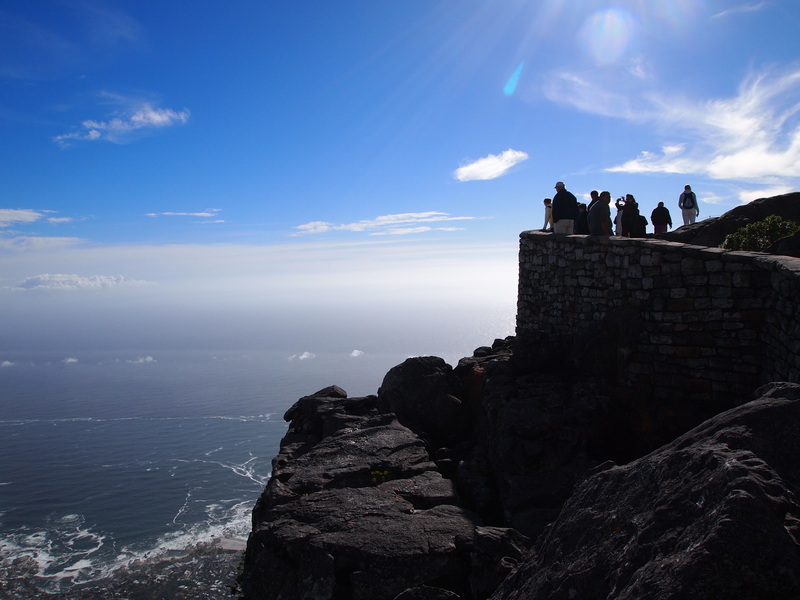 I briefly talked about hiking Table Mountain in Cape Town, Africa a few weeks ago in my post about my Couchsurfing experience in Cape Town, but I wanted to give you some additional information! 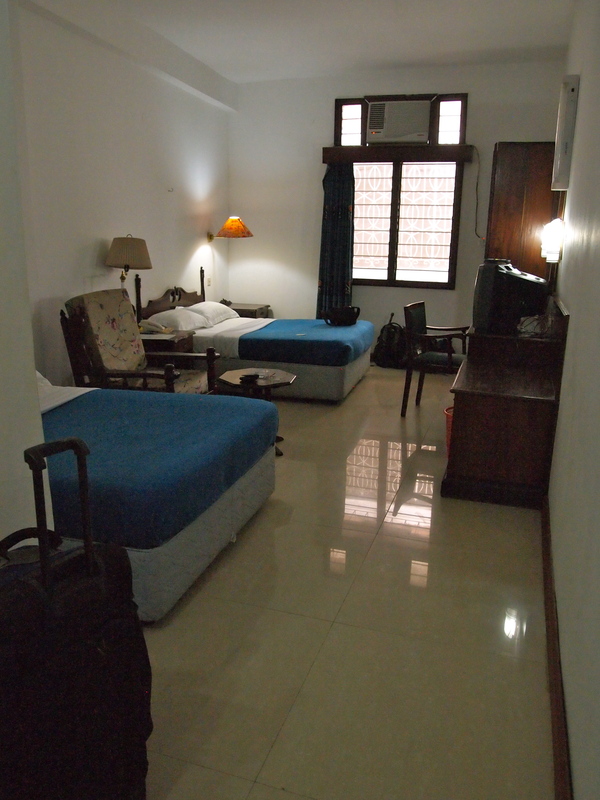 I had researched a few companies and hikes on Trip Advisor and was interested in the India Venster trail. 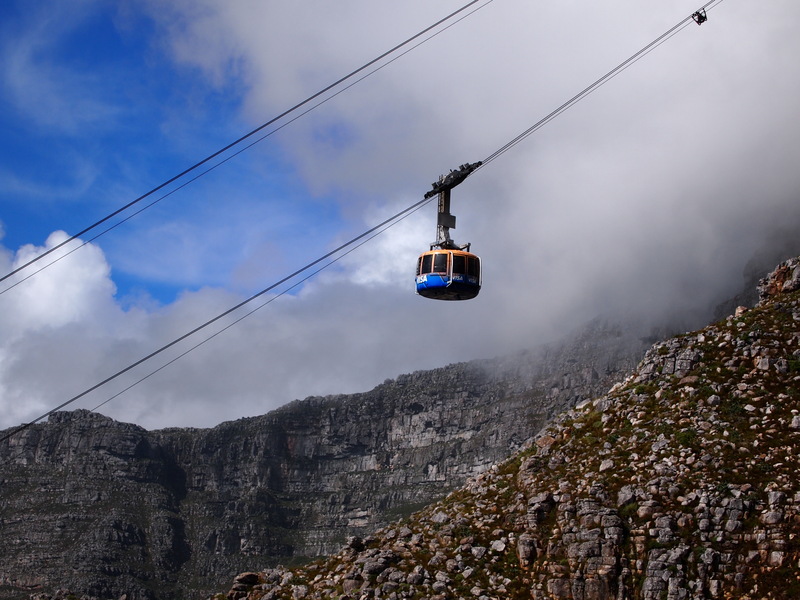 I had decided to wait until I arrived in Cape Town to make any arrangements, mainly because of weather. I’m glad I did, because the people I couchsurfed with were able to get their neighbor, Keith, to hike the India Venster trail with me. Being a local, he was very familiar with this trail. I had read that it isn’t marked as well as some of the others and is a little more challenging because of some rock scrambling. In America it would be considered a Class 3 level for rock climbing. I was a bit nervous, but wanted a challenge. There was only one spot on the trail where I was finding spots for my fingers within the rocks and was perched precariously…wondering what I had gotten myself in to! 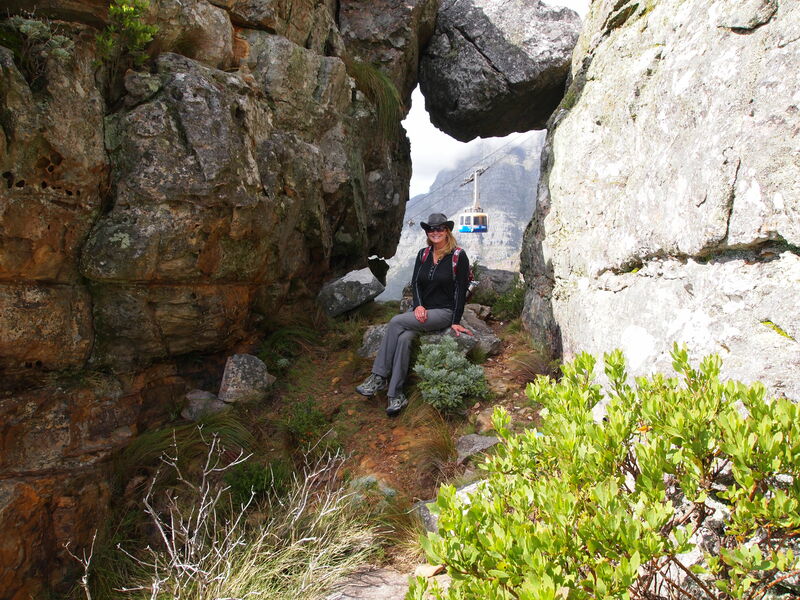 The Platteklip Gorge is an easier route for those that don’t want a little thrill! 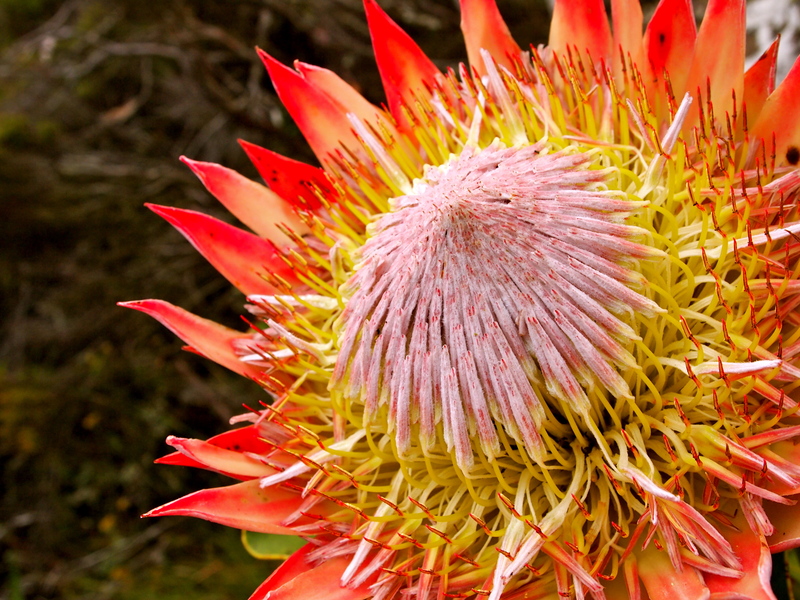 I had arrived to Cape Town from Ohio, North America the day before, but slept well, so I felt up to it. Luckily, the day was mostly sunny and we had spectacular views! 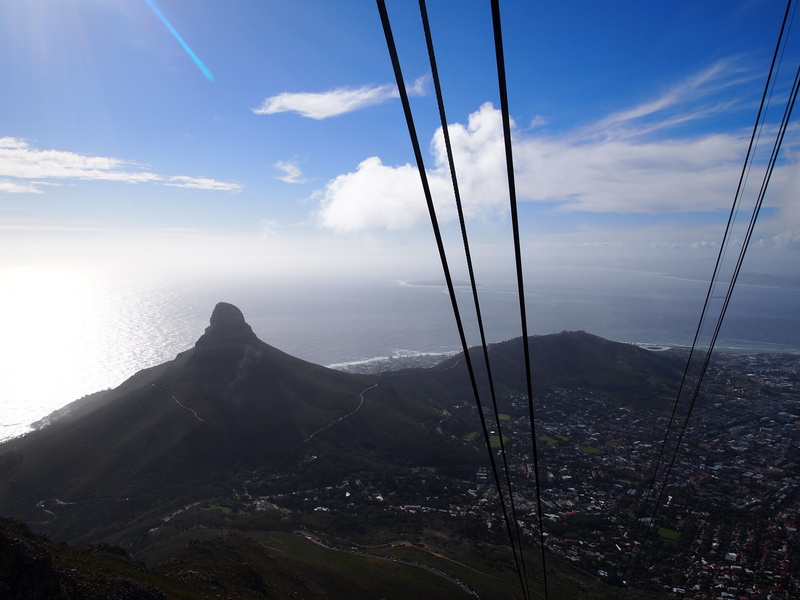 The view coming down in the cable car….Spectacular!! There have been a number of deaths on this trail, with various contributing factors such as…inferior physical fitness level, traversing down is more difficult than going up, rapid weather changes, and others. 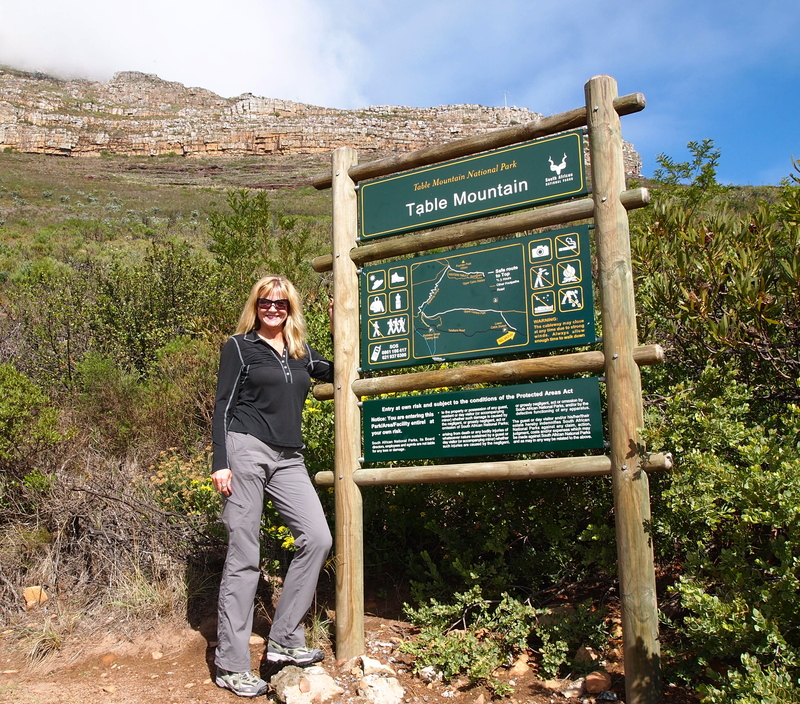 I thoroughly enjoyed my hike on Table Mountain! It was even better than I expected!! 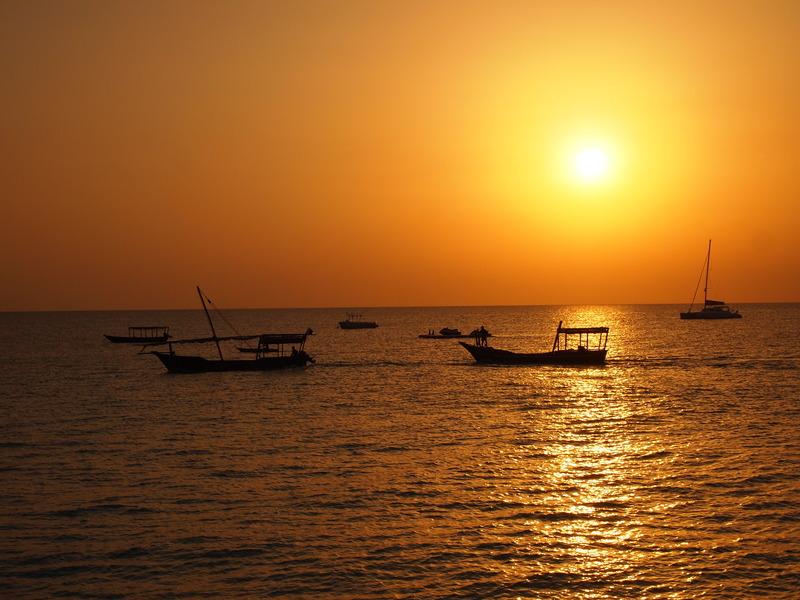 It was time to return to Stone Town, Zanzibar for one final night after staying two nights about an hour North of Stone Town in the seaside town of Nungwi. I would be making my way back home to Ohio after spending 40 days going through six (actually seven if you count going into Zimbabwe to see Victoria Falls from that side) countries in Africa! 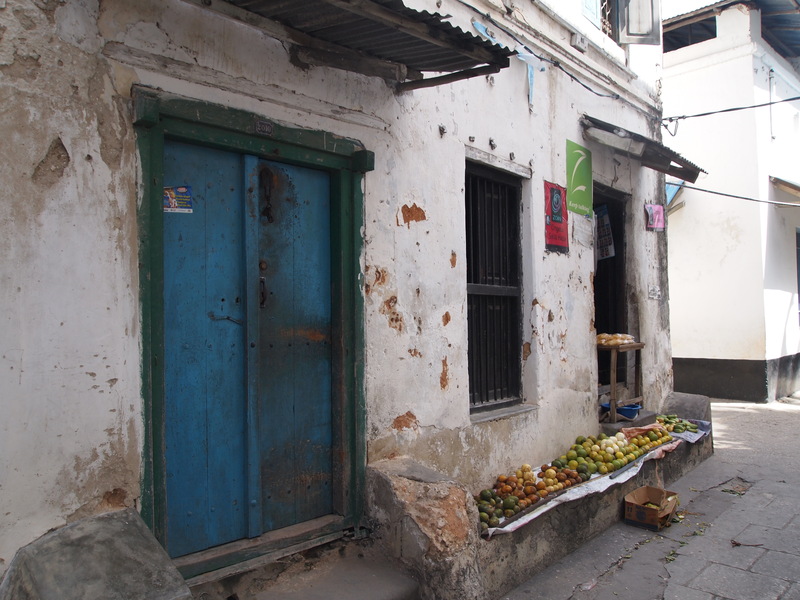 I had only explored Stone Town for an afternoon a few days previously, so I was looking forward to another day of walking from one twisting street to the next…getting lost and taking lots of photographs! 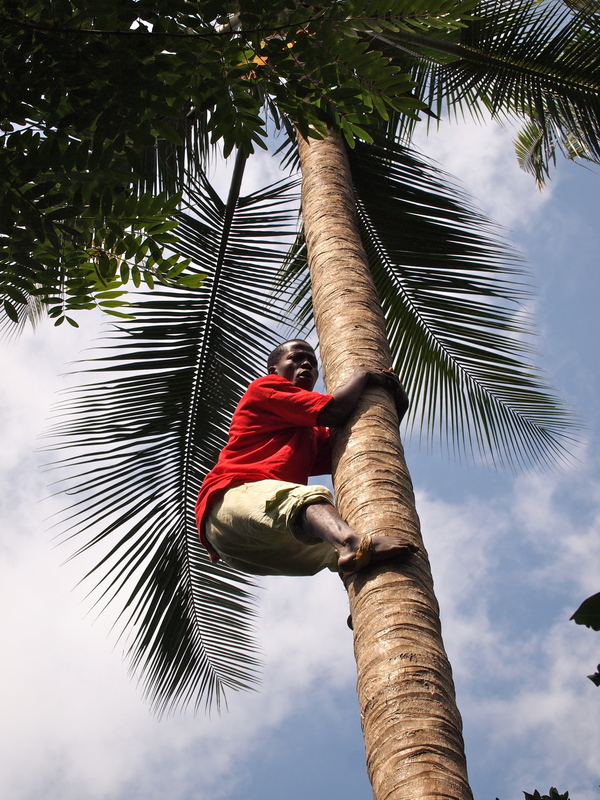 We had learned to say “No thank you” in Swahili “Hapana Sante”, but we also learned to say “Thank you very much” — “Sante Sana”. I enjoyed saying that more! I went out on my own this time and felt very safe. That’s one of the things I learned on this trip (that will be another post). You may read that somewhere is not safe or someone will tell you a story of something bad that happened to them, but if you keep an open mind, you have a completely different experience (but I don’t mean travel in areas with a war going on…you know what I mean!). I asked one of the locals where a good place to eat was and he said Lookiman’s (or something like that). 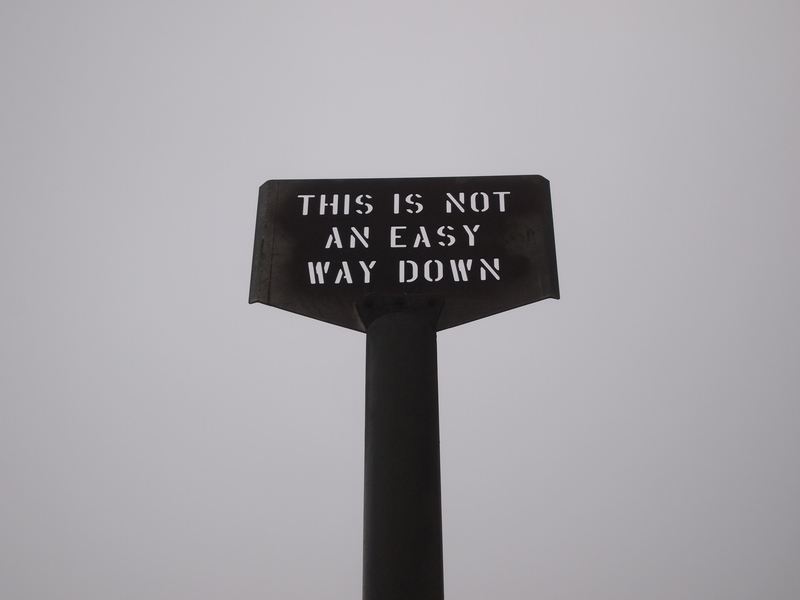 He gave me directions, but there aren’t many street signs, so I asked someone else along the way and ultimately found the restaurant. It was definitely a locals’ hangout, so I knew the food would be good. 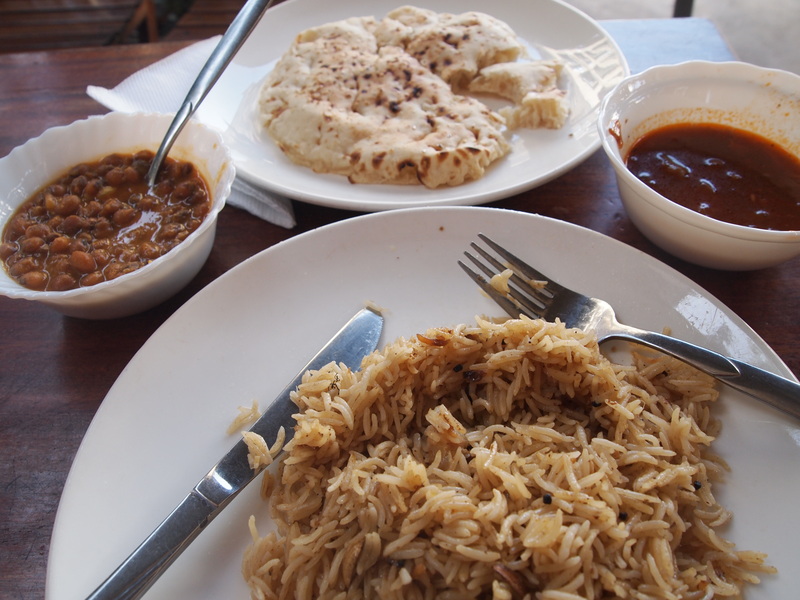 I had lentils, some type of curry, a yummy rice and some naan bread. 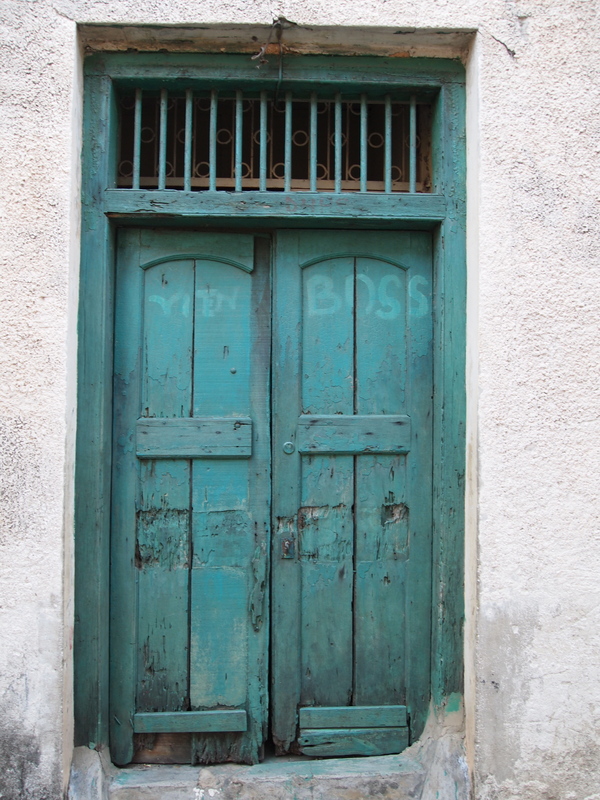 Although Stone Town was amazing…I was ready to go home! I was more mentally/ emotionally exhausted than anything! But stay tuned, we’re not finished with Africa yet! 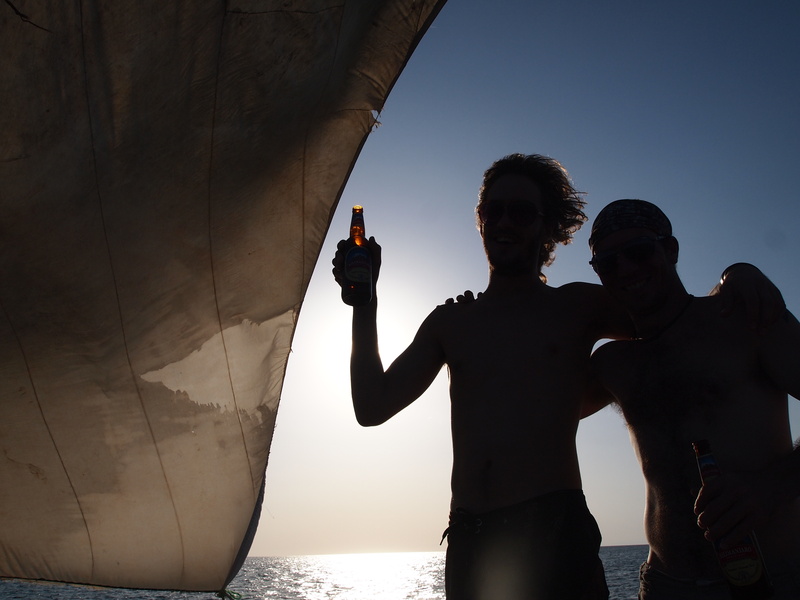 There was one life jacket, but plenty of drinks!! Here’s our driver…James and another G Adventures Tour Director in training. 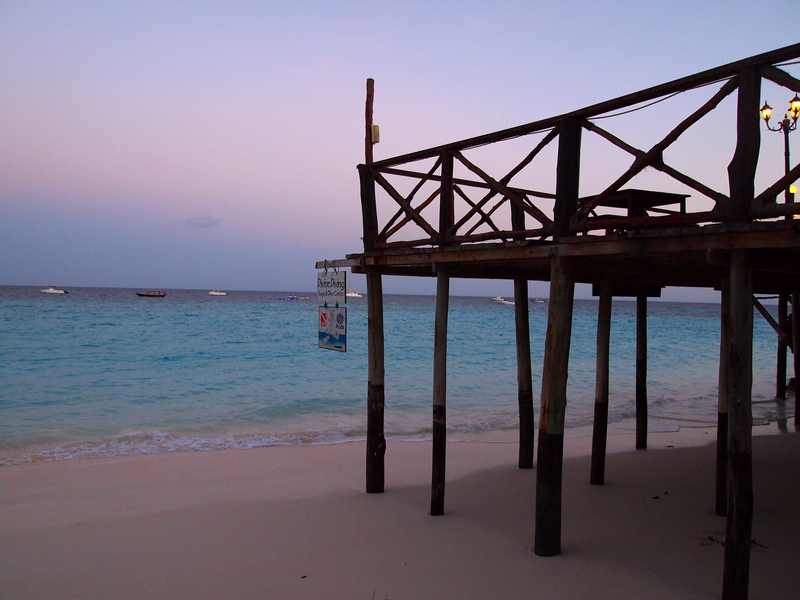 That night after the cruise, we had a great time on the beach…eating, drinking and dancing! It was so much fun…I don’t have any photos!! 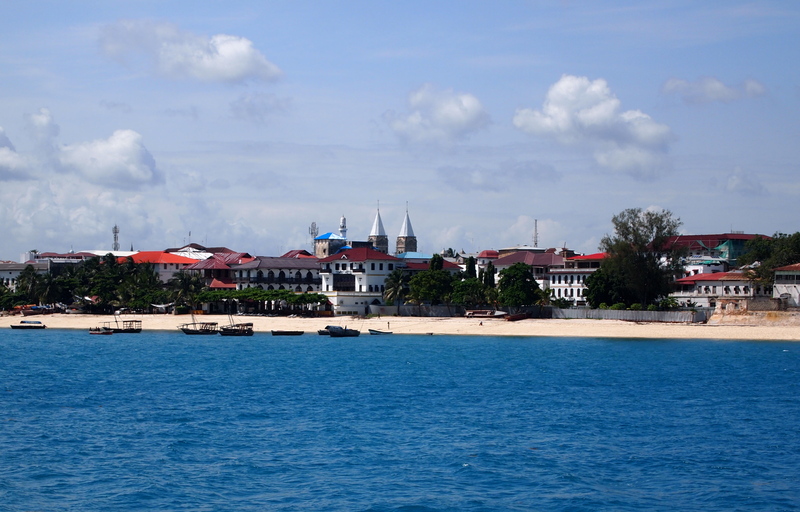 The seaside town of Nungwi on the Island of Zanzibar is absolutely gorgeous! With only three days left of my G Adventures 35 day Overland Truck tour through six countries in Africa, I was ready for some relaxation! 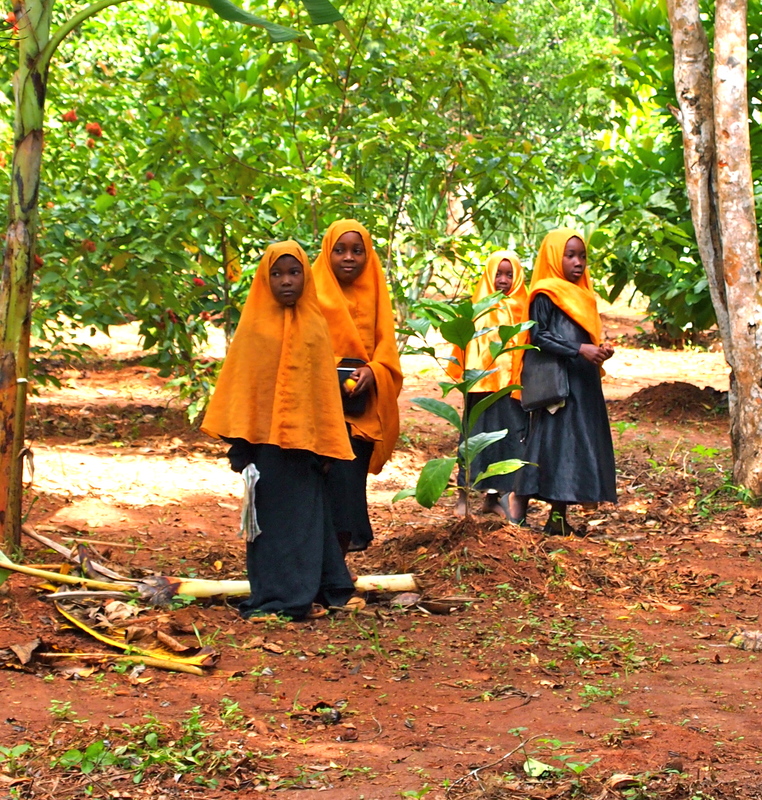 After a two-hour spice plantation tour, we headed to the Amaan Bungalows in Nungwi. I thought this was pretty cool…underwater Yoga! 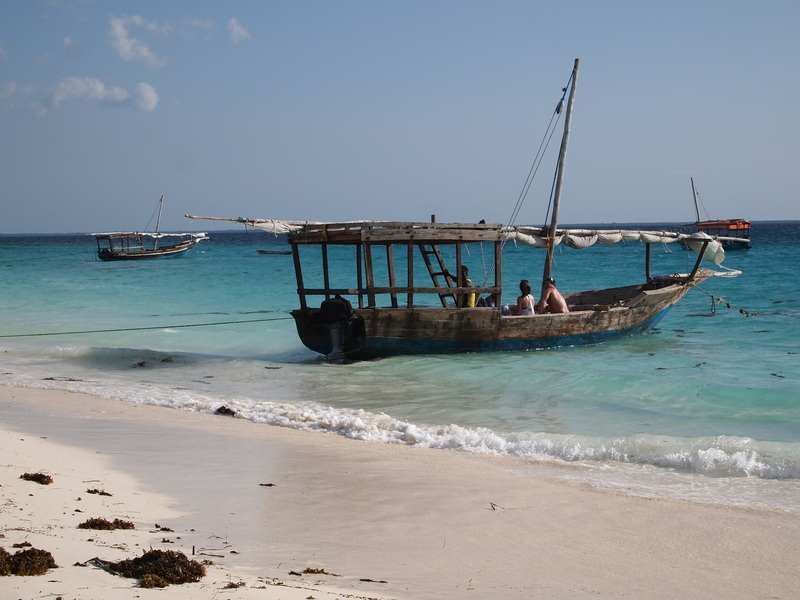 It didn’t take me long to hit the beach…my first time in the Indian Ocean! 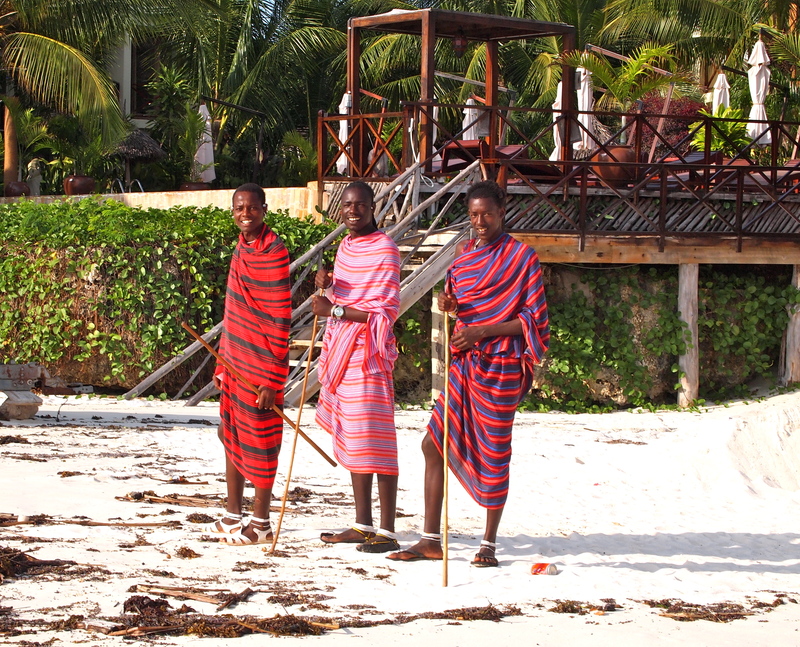 And a sight I’ve not encountered anywhere else…Masai Mara on the beach! And looking quite dashing!! That evening I played pool with some of the people from our group and our Tour Director and Driver…Jess and James. We had a great time!! 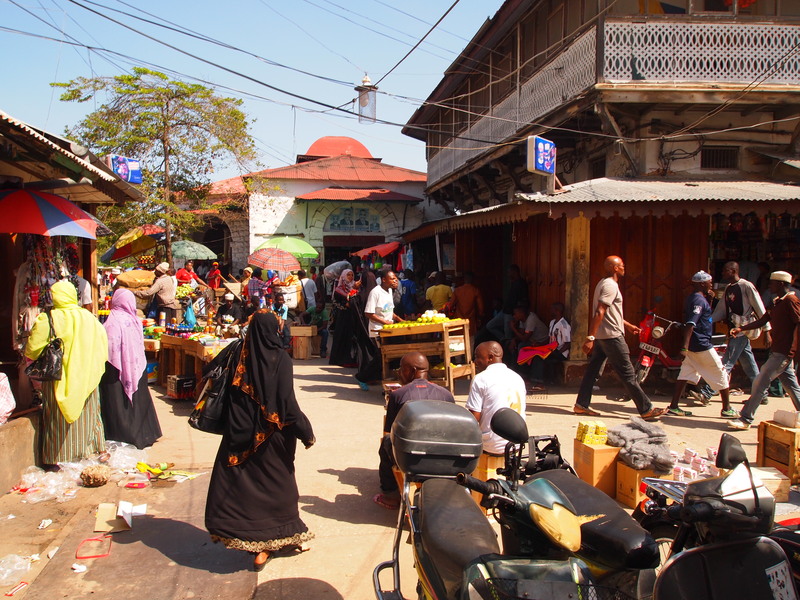 An activity that was included in my 35 day G Adventures Overland Truck adventure was a two hour Spice Plantation Tour on the island of Zanzibar—off the coast of Tanzania. 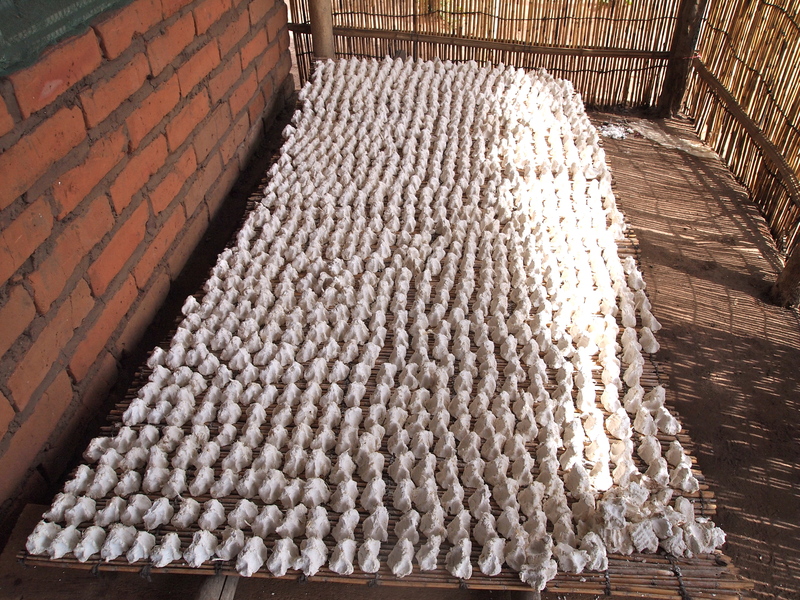 Spices are one of the top forms of revenue for Tanzania; although they’ve been surpassed years ago by Indonesia. We got to try different types of fruit, like Mango, Oranges, Grapefruit, Pomegranate, Papaya, Passion Fruit, Banana, Soursop, Pineapple and Coconut! 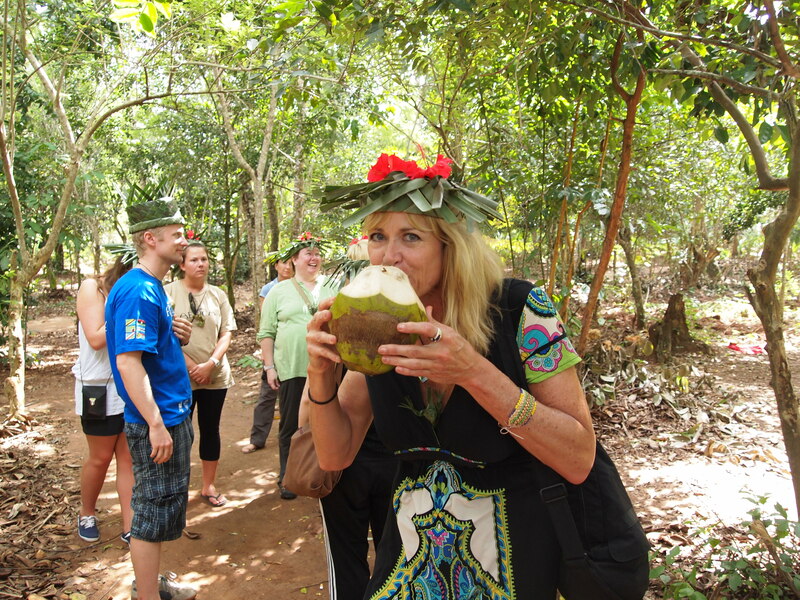 They made hats for us and we drank coconut juice! 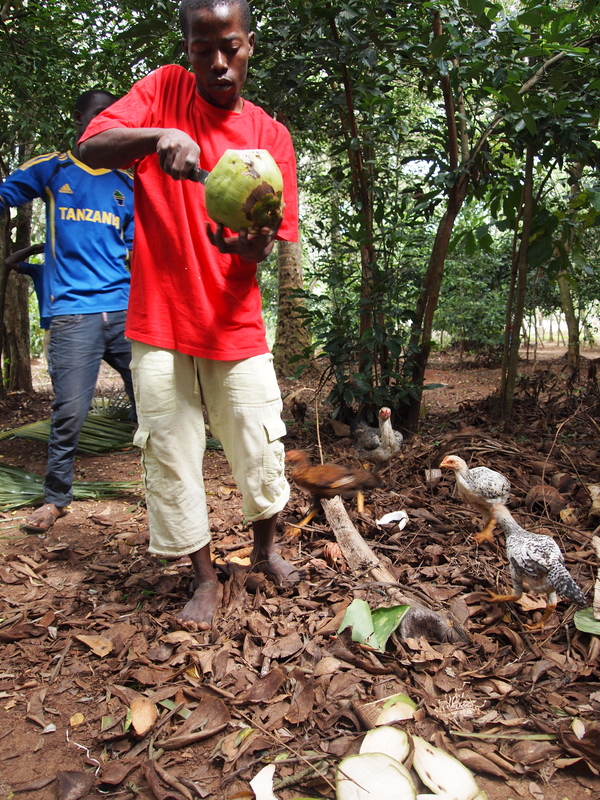 The chickens were fighting over the coconut droppings. 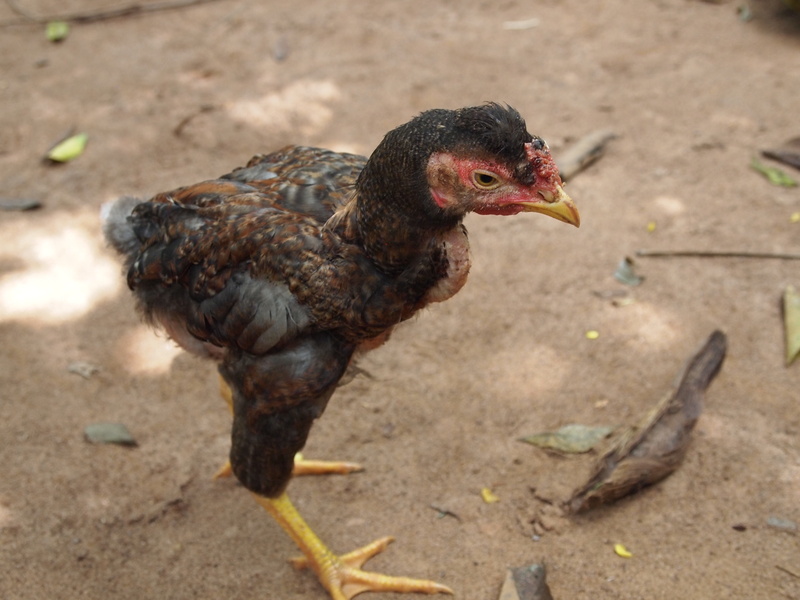 This chicken was strange looking! This guy wrapped some type of strong leaf in a figure 8 around his feet, jumped up on the tree and began leaping like a frog up the tree! He was singing the entire time and made it to the top! 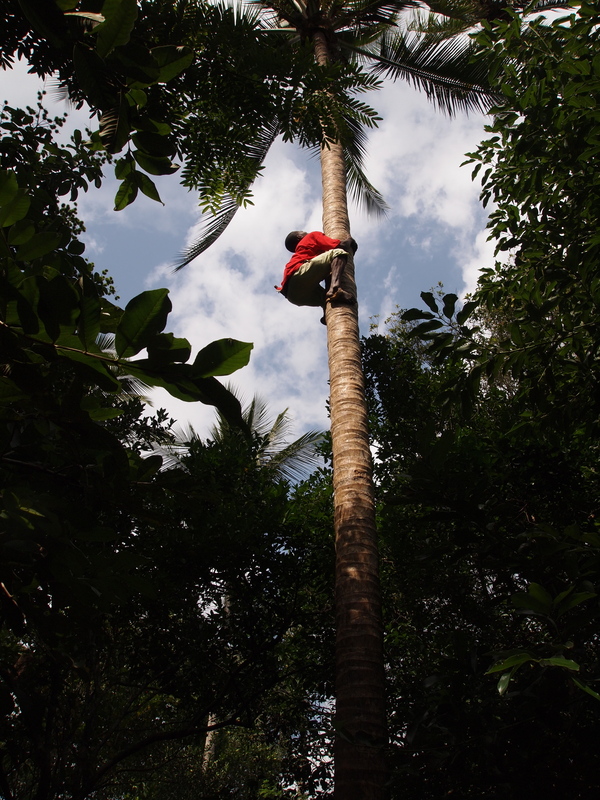 Another guy in our group wanted to try it…he got up about 8 feet and stopped. It’s harder than it looks!! 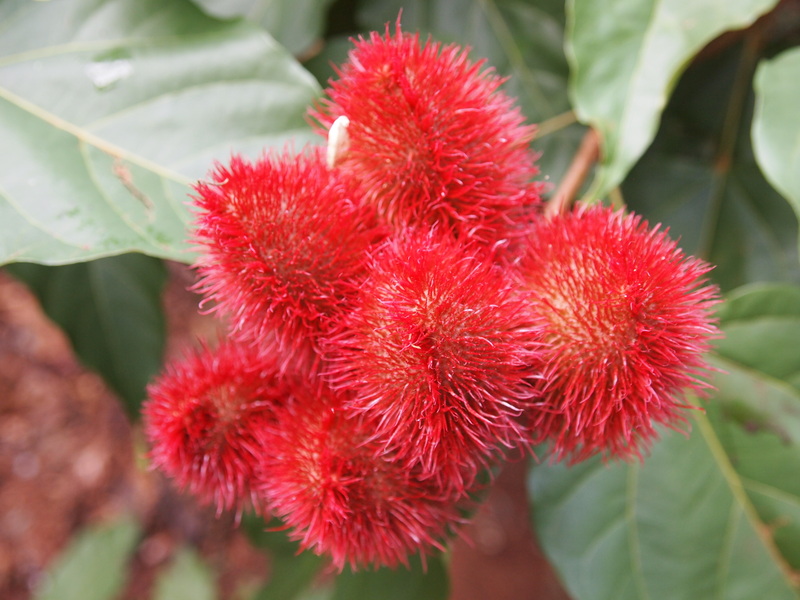 During the tour we stopped at all types of spice plants/trees. This is nutmeg. 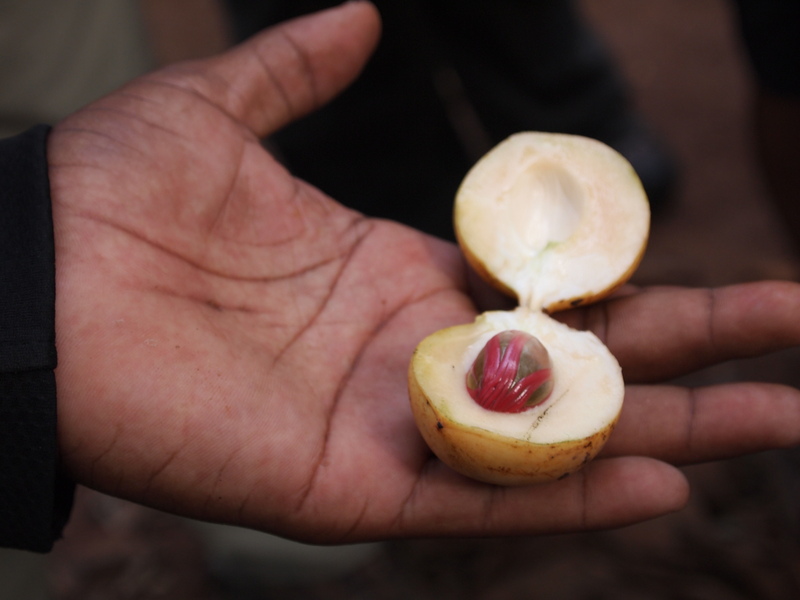 The guide would give all of us some of the plant, have us smell it and see if we could guess what it was. 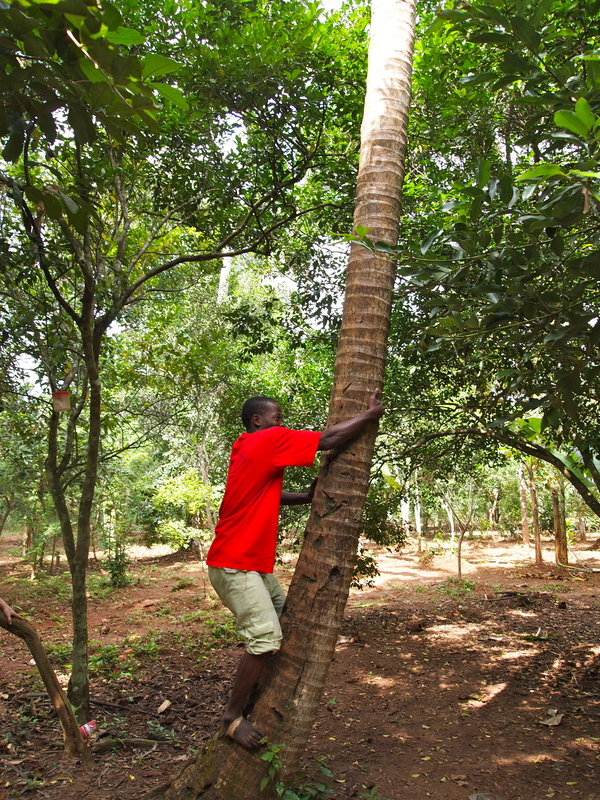 The Spice Plantation tour was quite educational! 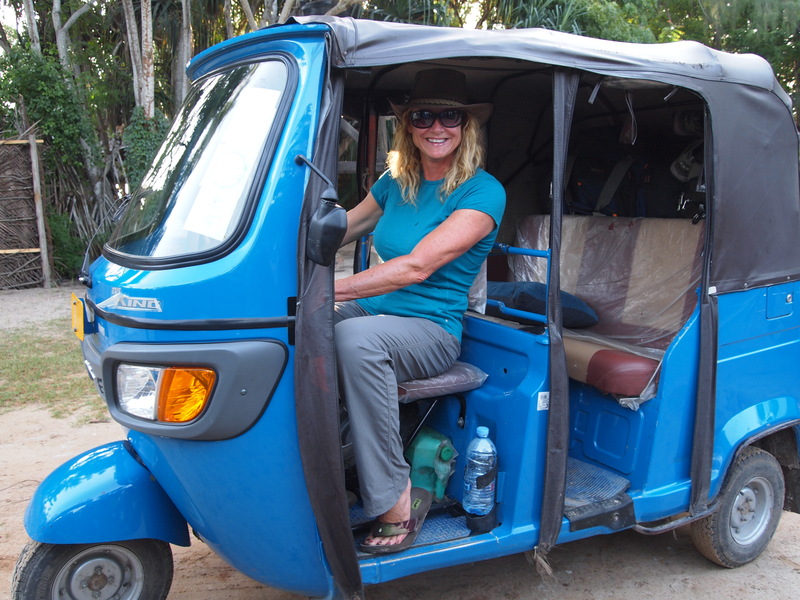 If you read my last post (see here), you know that my G Adventures 35 day Overland Truck tour had a 13 hour day yesterday, driving through Tanzania, to Dar Es Salaam, where we spent the night camping. 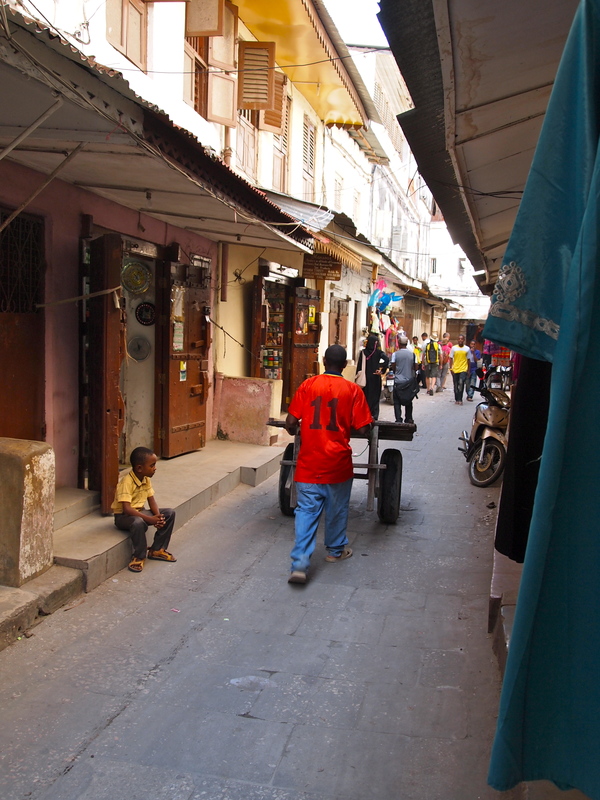 The next morning we were packed up and left by 7:30am via Tuk Tuks, with Stone Town, Zanzibar as our destination! 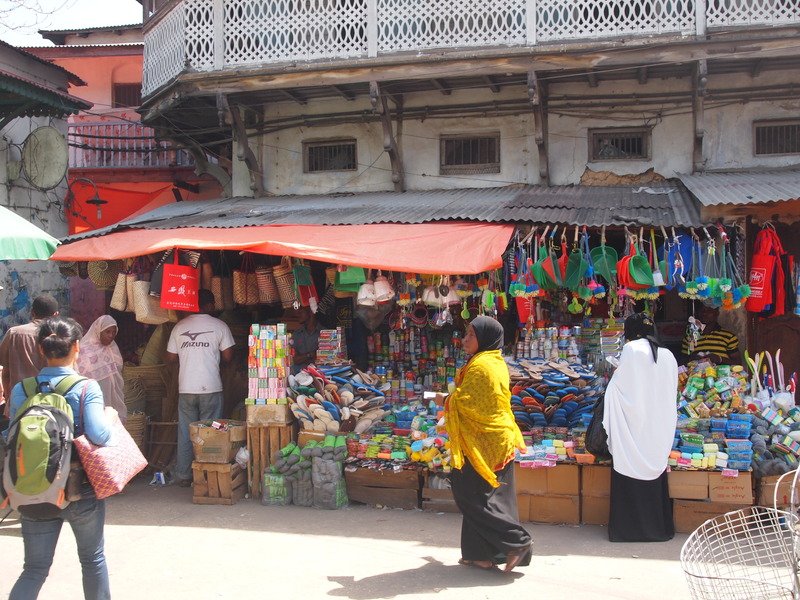 Stone Town (a World Heritage site) is 95% Islam with an average life expectancy of 48 years and the main sources of income are tourism and the sale of spices. 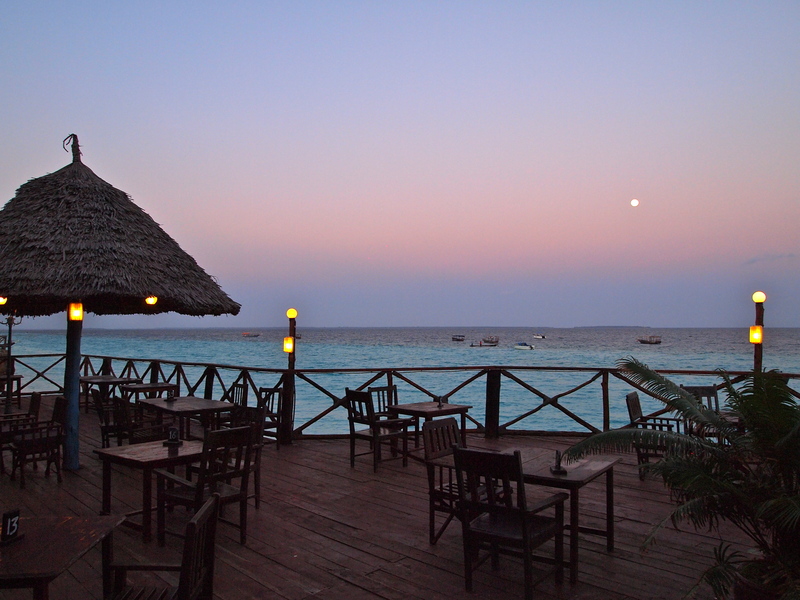 We made our way to Mazson’s Hotel, where we would stay for one evening, before heading North to a beach resort in Nungwi, which is located about an hour away. This was my room and my roommate’s name was Suzanne. She is from Belgium! Because this was an ending and/or beginning point for G Adventure trips, new people joined our group. 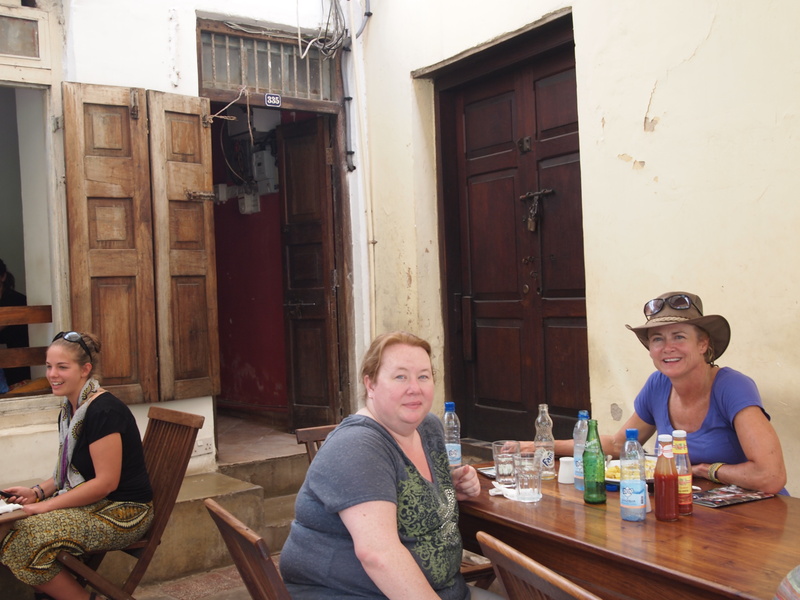 I met Samantha and Kathleen, Scientists from America, and they said they had gone out walking around Stone Town and didn’t like the assertive touts trying to sell things to them. 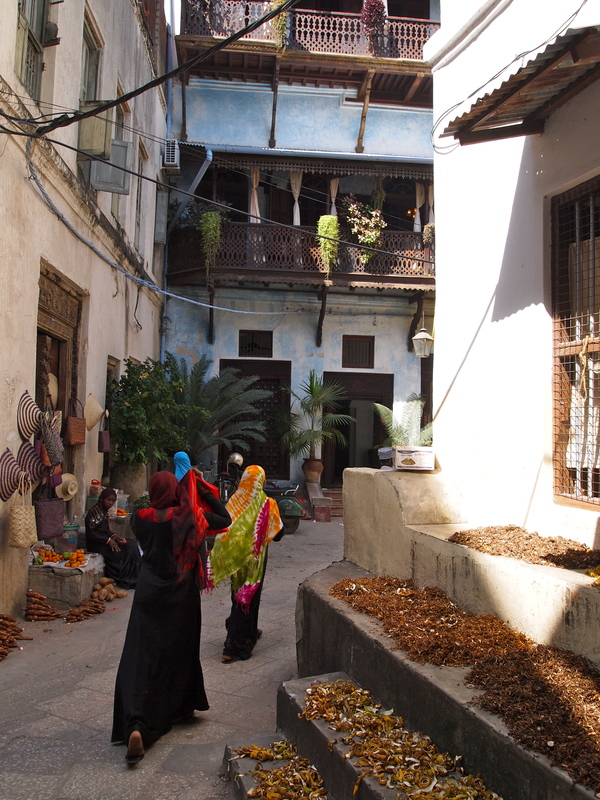 We had learned how to say “No Thank You” in Swahili, “Hapana Sante”, so the three of us set off to get lost in the winding, narrow streets of Stone Town. It was an odd feeling to not consult a map…to just walk and not care if you didn’t know where you were. I had a good time saying “Hapana Sante” with a smile on my face and the touts seemed to like it! It became a game! 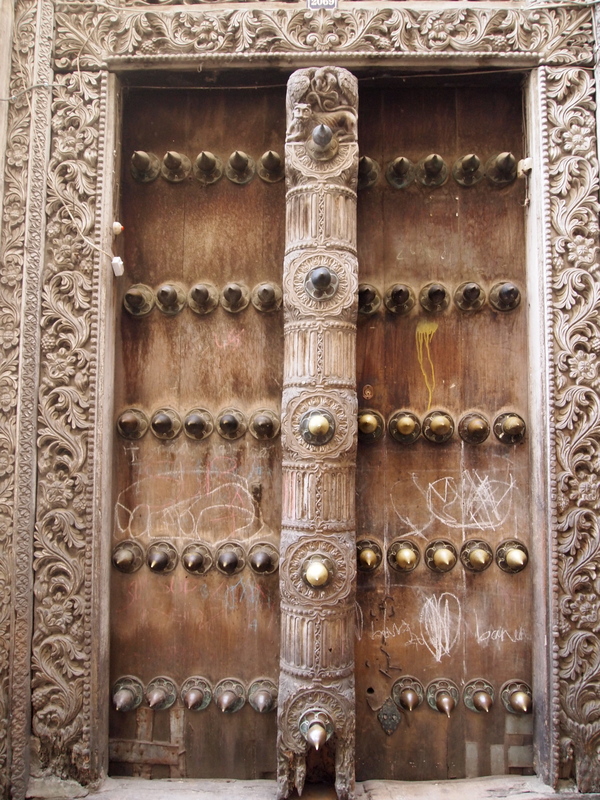 It reminded me a bit of Egypt, but they weren’t as aggressive… or I was just more prepared. 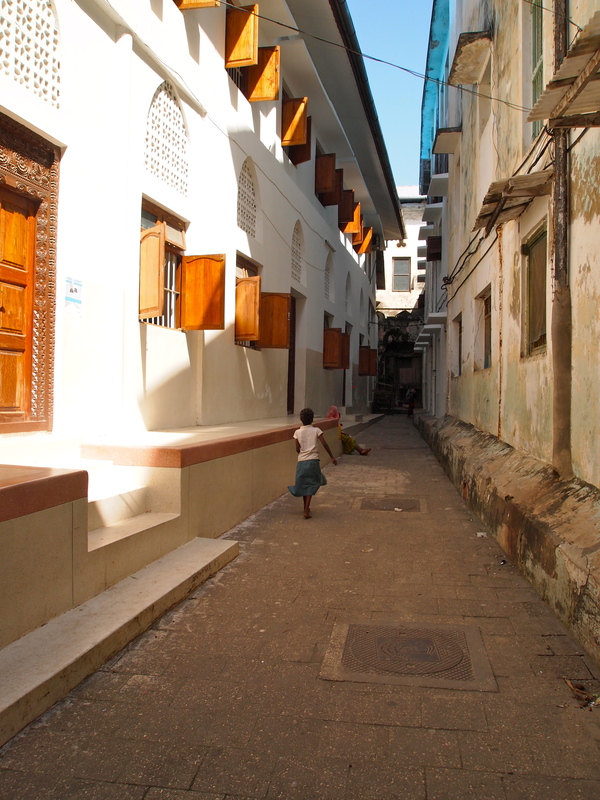 The architecture, people and culture of Stone Town, Zanzibar were very intriguing to me!